I know that most people might not immediately associate sauerkraut with Italy – but that’s only because they have never been to the North-Eastern regions! 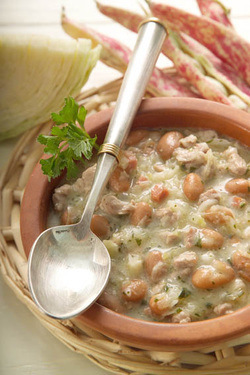 For example, sauerkrauts are actually the main ingredient in Trieste’s signature soup, the Jota (pronounced yota, from the Latin term for soup). Trieste is the largest Italian port city on the Adriatic and was for a long time the trade crossroads between the Austro-Hungarian Empire and Western Europe. It also boasts a rich and fascinating Jewish history. In the 14th and 15th centuries, Jews fleeing from German lands settled here to make a living as moneylenders, bankers, and merchants. Even women practiced money-lending in Trieste, an unusual custom at the time. More Jews arrived in the following centuries from Spain and the Ottoman Empire, and finally in the late 18th century from Corfu. Trieste in general, and Jewish Trieste in particular, was cosmopolitan and cultured, and the local dishes give us a little taste of such flair . James Joyce, who lived in Trieste for 16 years and at one point fell in love with his Jewish Triestine student Amalia Popper, would probably agree. Soak the beans overnight, drain and cook in a large pot of water for a couple of hours until tender. Add the sausage if using. Add the cubed potatoes (Some people cook them separate. Some people also mash 1/3 of the beans.). Heat the oil in a pan, add the garlic and cumin and cook until the garlic is golden. Add the sauerkraut and cook for 10 more minutes. Discard the garlic clove, add the bay leaf and cover with little water; bring to a simmer. When the cubed potatoes are soft, combine the sourkrout soup with the potato and bean soup, and allow to simmer for about 45 more minutes, stirring often. Top individual servings with a drizzle of olive oil and freshly ground pepper, plus more salt if needed (but the sourkrout tend to be salty). *** on Parve versus Meat: I like it with a little beef or beef sausage in it, but many people I know prefer the parve version because it’s more digestible: it’s really a matter of personal preference.